The last show of the 2014-2015 season has to be a winner. 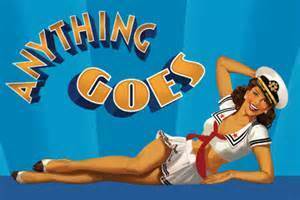 “Anything Goes” has such Cole Porter show stopping songs like “I Get A Kick Out Of You”, “You’d Be So Easy To Love”, “You’re The Top”, “Friendship”. “It’s De Love-ly”, “Blow Gabriel Blow” not to forget the title number or 13 other songs. Since its debut in 1934 it has been performed all over the world and tonight it is stopping at the Broward Performing Arts Center and I’ll be there with my tap shoes on even if I can’t dance! ‘When the S.S. American heads out to sea, etiquette and convention get tossed out the portholes as two unlikely pairs set off on the course to true love… proving that sometimes destiny needs a little help from a crew of singing sailors, an exotic disguise and some good old-fashioned blackmail. ‘ tells the plot of the show but not the fun the audience has watching it. Starring Emma Stratton as Reno Sweeney and Brian Krinsky as Billy Crocker this is a musical cruise I am looking forward to and I’ll let you know all about it.